My husband and I go through Greek yogurt at an almost alarming rate. Every single time I hit the grocery store, I’m buying one or two of the largest tubs I can find of our favorite brand. Each time I peel back the foil on a new tub, I think to myself “didn’t I JUST open a new container?” The answer is yes, yes I did. The funny thing is, we rarely eat yogurt just as yogurt. Maybe one morning a week, one of us will have a vacation-in-Greece-inspired bowl of yogurt topped with honey and walnuts, but that only accounts for a small portion of the yogurt we go through. The vast majority of it is used as an ingredient in savory recipes. 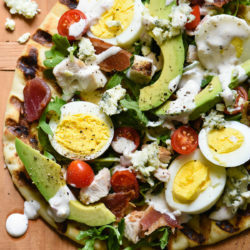 Yogurt-based salad dressings, yogurt sauces for chicken and fish, yogurt in place of sour cream or mayonnaise in just about anything. 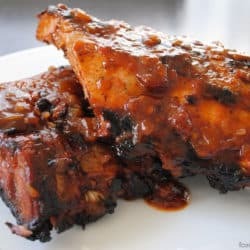 I’m sure you’ve noticed it in at least half the recipes on this blog! That’s why I’m always thrilled when brands like Hidden Valley® create products that fit into my Greek yogurt-obsessed life. 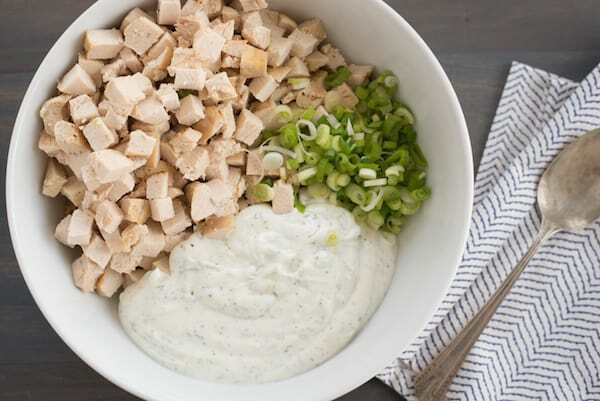 By simply stirring Hidden Valley® Greek Yogurt Dips Mix into nonfat Greek yogurt, I have a creamy dip with less fat, more protein, and fewer calories than traditional ranch dip. But I didn’t stop there. 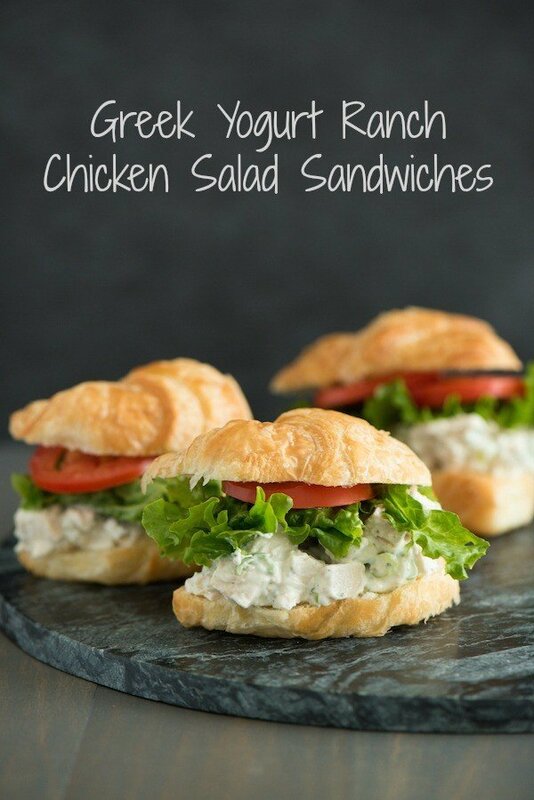 I stirred the dip into a bowl of chopped chicken breast and green onions to create these flavor-packed Greek Yogurt Ranch Chicken Salad Sandwiches. 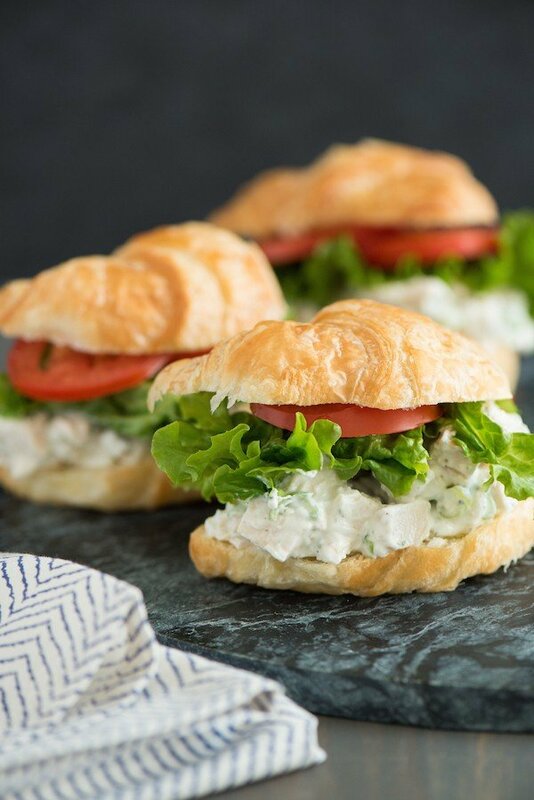 Served on croissants, traditional bread, or even as lettuce wraps, these sandwiches are perfect for a party, or to keep in the fridge for lunches throughout the work week! In small bowl, stir together dip mix and yogurt. 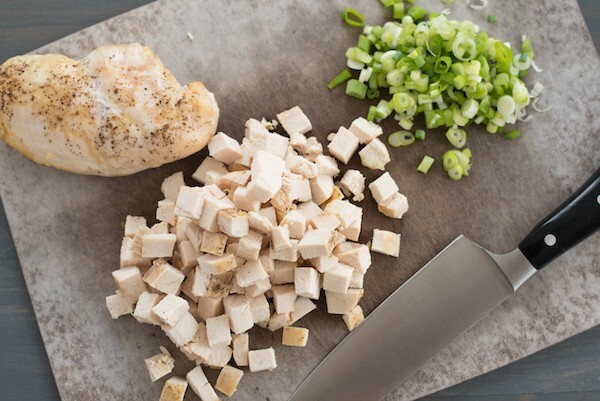 In large bowl, toss chicken, onions and yogurt mixture until well combined. 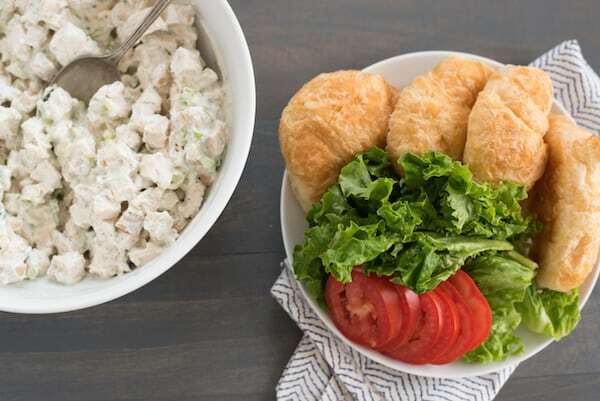 Serve chicken salad on croissants, topped with lettuce and tomato. 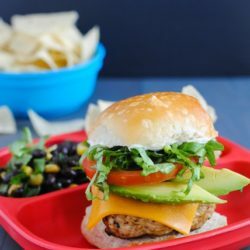 This post was sponsored by Hidden Valley through their partnership with POPSUGAR. While I was compensated by POPSUGAR to write a post about Hidden Valley, all opinions are my own. This chicken salad was so good! And, as your husband, I appreciated the touch of having mini croissants so I could eat more. Yum. 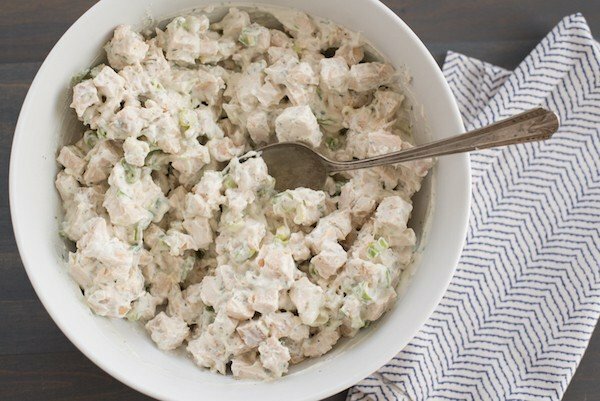 I always steer clear of chicken salad because of mayo…but this is a genius move using Greek yogurt instead….and a ranch version on top of that. *swoon* I can’t wait to make this! Thanks, Alida! Why I’m not anti-mayo, I’m definitely VERY pro-Greek yogurt! haha. I use Greek yogurt in everything too! Love that Hidden Valley now customized their mixes for it! With kids, you must go through even more Greek yogurt than we do, Brianne! Seriously, I should buy stock in my favorite brand of it. Oh wow, these look fantastic! I love Greek yogurt, but like you, rarely just eat it as yogurt, I’m always looking for other ways to use it. 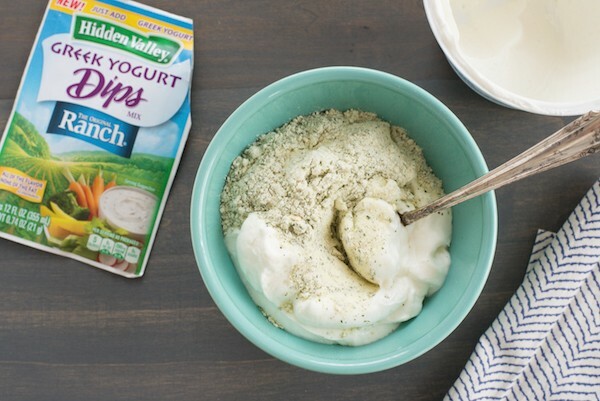 I can’t wait to try these, anything that combines my love of Greek yogurt with my love of ranch is a very good thing! I too love using greek yoghurt in cooking.. especially when it’s paired up with chicken. I can imagine these sandwiches taste just as delicious as they look. Sounds good! Let me know if you try it like that, Christine!